St. Mary’s Dominican High School Senior High Choir members (from left), First Row: Lindsey Sellers, Paige McGaha, Veronica Smith, Kayla Goudeau, Rebecca Koenig, Elizabeth Champagne, and Celeste Maffei. Second Row: Molly Gaffney, Delanie Wheeler, Lili Cerise, Catherine Cerise, Ceci Bourg, Maggie Conrad, and Choir Director Ms. Brenda Castillo. 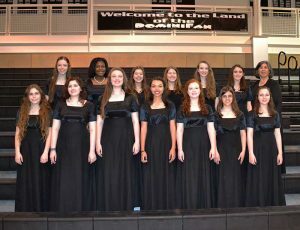 St. Mary’s Dominican High School’s Choir brought home honors at district competition hosted by the Louisiana Music Educators’ Association (LMEA). The junior high school honor chorus performed under the direction of Dr. Susan Brumfield and the senior high chorus performed under Mr. Sean Ivory’s direction. These clinicians are known internationally as outstanding composers, arrangers, authors, artistic directors and vocal educators. DHS Fine Arts Department Chair Ms. Brenda Castillo is director of the DHS choir. 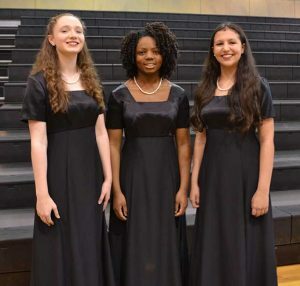 St. Mary’s Dominican High School Junior High Choir members (from left) Elise Bourg, Pelarr Edwards, and Sarah Rogers. Junior High: Elise Bourg (Harahan), Pelarr Edwards (New Orleans), and Sarah Rogers (Metairie). Soprano 1: Ceci Bourg (Harahan) and Paige McGaha (Metairie), Veronica Smith (New Orleans), and Madison Weber (Destrehan). Soprano 2: Kayla Goudeau (Marrero), Rebecca Koenig (Metairie), and Molly Gaffney (Harahan). Alto 1: Lili Cerise (Metairie) and Catherine Cerise (Metairie). Alto 2: Veronica Stevens (New Orleans), Gillian Sudderth (River Ridge), Delanie Wheeler (Marrero), Lindsey Sellers (Metairie),Maggie Conrad (New Orleans), Elizabeth Champagne (Luling), and Celeste Maffei (Metairie).